Schwinn Produce Farm started as a traditional family garden. Jerry Schwinn, as did his father before him, had a large garden. With his love for the taste of cantaloupe never quite satisfied, one summer Jerry decided to plant more than he knew he could handle. As the crop began to mature, it was obvious that there were more melons than the family could eat. So one evening Jerry, along with the help of his two sons, loaded the cantaloupe and went to town. The melons were sold at the A&P grocery store in their hometown of Leavenworth, Kansas. The following summer Jerry, a full time carpenter in Kansas City, had proposition for his two boys. He told Jay, 11, and Joe, 8, if they were to take care of what he planted they could have the money for whatever they sold. They took him up on it. That year the crop was sweet corn. By the county fair that summer, in mid-August, the crop was in and each boy had $20 in his pocket. Spending their own money at the fair gave them a wonderful feeling. Wanting to learn more about the farming industry and being able to work with cattle and swine, the next summer Jay went to work for April Valley Farms. Joe had decided he wanted to raise vegetables. He enrolled in the gardening project through 4-H. The sweet corn patch was increased and other crops were planted. His younger sister Marti helped him sell the produce under the shade trees where the farm is still rooted. With about 10 acres to work with, Joe's goal was to have the whole farm in vegetables by the time he was a senior in high school. He was two years ahead of schedule. 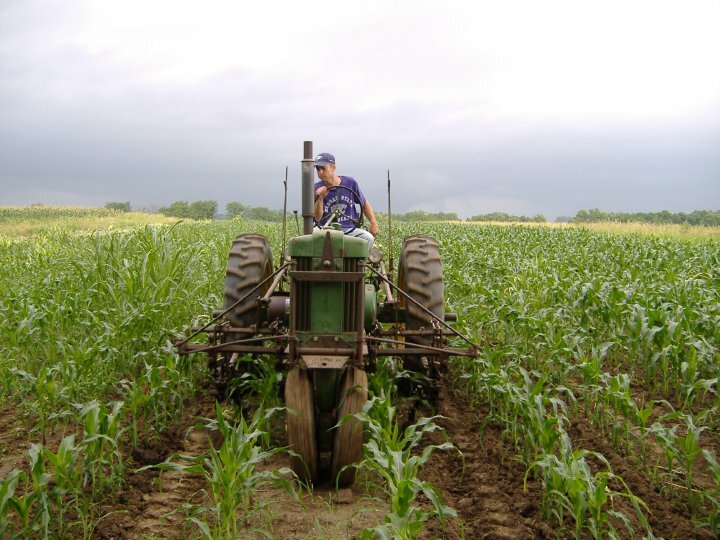 Upon graduation from Immaculata High School, Joe went to study vegetable production through the Horticulture Department at Kansas State University. In 1990, the year he graduated, he rented five acres from April Valley Farms to increase production. The following summer that five acres was released and 36 acres that is adjacent to the original farm was rented. Not all of this was put into vegetable production until 1996. 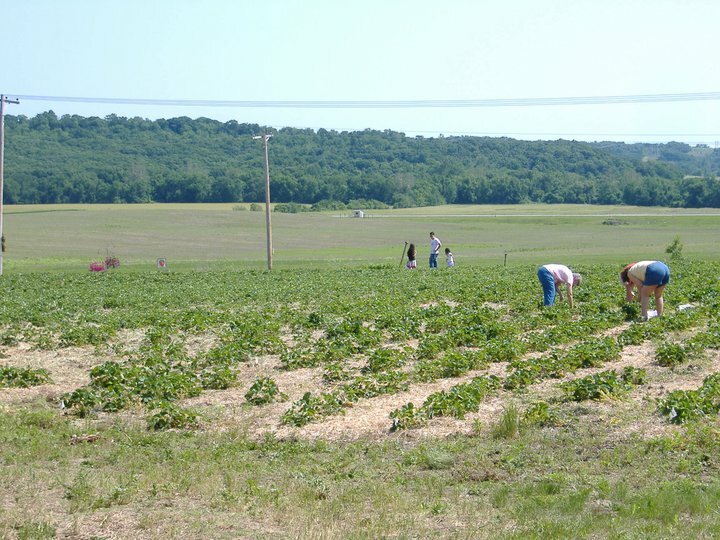 In that year, all 45 acres managed by Schwinn Produce Farm were in vegetable production. Also in 1997, the ground that had been rented was purchased. This was very exciting since the ground was once owned by Joe's grandparents. His mother Pat can remember when her own mother had a large garden on their farm, too. Many additions have been made to the farm since the first sweet corn was sold under the tree over 30 years ago. Now a market building houses the sales on the farm. Every Wednesday and Saturday, Schwinn Produce Farm sells fresh produce at the Leavenworth Farmers Market. A greenhouse and two hoop houses have been put into place where transplants are started and bedding plants are sold to help things get started in early spring. Pick-your-own strawberry patch has been added for families to enjoy in the springtime. Pick-your-own pumpkin patch and hayrides bring many smiles to families in the fall as they search for the "best" jack-o-lantern pumpkin. In a business where there are so many unknowns, especially the weather, one thing remains the same. Quality. Schwinn Produce Farm uses the latest techniques and plants and only the finest seeds to meet the high standards its customers have come to expect.